Hydrometer test is carried out to quantitatively determine the Particle/Grain Size Distribution for soil particles of size smaller than 75 micron. Calibrated at 27°C, range of 0.995 to 1.030 g/cc, graduation lines at interval of 0.0005; in conformity with IS-3104: 1965. The maximum permissible scale error on the hydrometer is plus or minus one scale division. 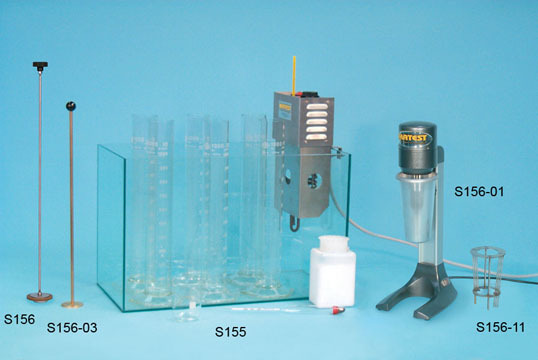 Two 1000 ml graduated cylinders, Dispersing agent solution containing sodium hexa-metaphosphate, Mechanical stirrer, Water Bath, Balance, Sieve, Dessicator and Centimetre Scale. IS-2720 (Part 4):1985 (Reaffirmed- May 2015) “Methods of test for soils: Grain size analysis”. Determination of volume of the hydrometer bulb (Vh): Pour about 800 ml of water in the 1000 ml measuring cylinder and note the reading at the water level. Immerse the hydrometer in water and note the water reading. 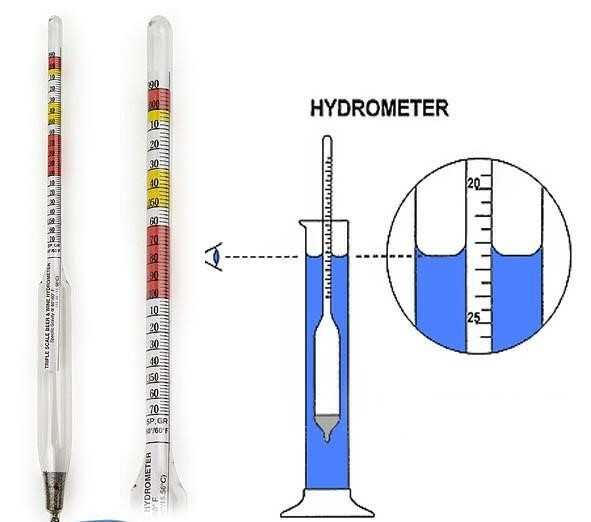 The difference between the two readings is recorded as the volume of the Hydrometer bulb plus the volume of that part of the stem which is submerged. For practical purpose the error due to the inclusion of this stem volume may be neglected. Alternatively, weigh the hydrometer to the nearest 0.1g. This mass in grams is recorded as the volume of the hydrometer in ml. This includes the volume of the bulb plus the volume of the stem. In order to find the area of cross-section (A) of the measuring cylinder in which the hydrometer is be used, measure the distance, in cm, between two graduations of the cylinder. The cross-sectional area (A) is then equal to the volume included between the two graduations divided by the distance between them. Measure the distance (h) from the neck to the bottom of the bulb, and record it as the height of the bulb. The distance from the neck of the bulb to the nearest calibration mark shall be measured and recorded. With the help of an accurate scale, measure the height between the neck of the hydrometer to each of the other major calibration marks (Rh). 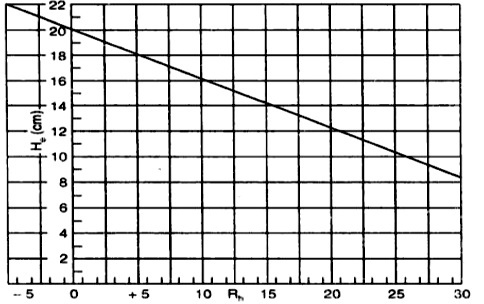 Draw a calibration curve between He and Rh which may be used for finding the effective depth (He) corresponding to hydrometer readings (Rh) during test. Insert the hydrometer in the measuring cylinder containing about 700 ml of water. Take the readings of the hydrometer at the top and bottom of the meniscus. The difference between two readings is taken as meniscus correction (Cm) which is a constant for a hydrometer. During the actual sedimentation test, the readings should be taken at the bottom of the meniscus but since the soil suspension is opaque, readings are taken at the top of meniscus, It is clear that readings decrease in the upward direction. Thus, the observed hydrometer readings are always less than the true one. Hence the meniscus correction is always positive. The percentage of soluble salts shall be determined. In case it is more than one percent, the soil shall be washed with water before further treatment. Weigh 50 to 100g of oven-dried soil sample (Md) passing the 4.75 mm IS Sieve (50g for clay soil and 100g if it is a sandy soil). Add 150 ml of hydrogen peroxide to the soil sample placed in a wide mouth conical flask and stir it gently for few minutes with a glass rod. Cover the flask with glass and level it to stand overnight. Next morning, the mixture in the conical flask is gently heated in an evaporating dish, stirring the contents periodically. Reduce the volume to 50 ml by boiling. Place the dish and its contents to the oven. Add 100 ml of sodium hexametaphosphate solution to the oven-dried soil in the evaporating dish, and warm the mixture gently for about 10 minutes. Transfer the mixture to the cup of the mechanical mixer using a jet of distilled water and stir it well for about 15 minutes. Transfer the soil suspension to the 75 micron IS sieve placed on a receiver and wash the soil on this sieve using jet of distilled water from a wash bottle. The amount of distilled water used during this operation may be about 500 ml. Transfer the soil suspension passing the 75 micron IS Sieve to the 1000 ml measuring cylinder, and add distilled water to make the volume to exactly 1000 ml in the cylinder. Collect the material retained 75 micron sieve and put it in the Oven for drying. Determine the dry mass of soil retained on 75 micron sieve. Insert a rubber ball or any other suitable cover on the top of the 1000 ml measuring cylinder containing the soil suspension and shake it vigorously end over end. Stop shaking and allow it to stand. 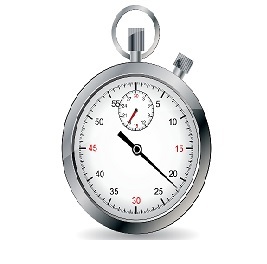 Immediately, start the stop watch, and remove the top cover from the cylinder. Immerse the hydrometer gently to a depth slightly below its floating position and then allow it to float freely. Take the hydrometer readings after periods of 1/2, 1, 2 and 4 minutes. Take out the hydrometer, rinse it with distilled water and allow it to stand in a jar containing distilled water at the same temperature as that of the test cylinder. The hydrometer is re-inserted in the suspension and readings are taken after periods of 8, 15 and 30 minutes; 1, 2 and 4 hours after shaking. The hydrometer should be removed, rinsed and placed in the distilled water after each reading. After end of 4 hours, readings should be taken once or twice within 24 hours, the exact periods of sedimentation being noted. In order to determine the composite correction, put 100 ml of dispersing agent solution in another 1000 ml measuring cylinder and make it to 1000 ml by adding distilled water. The cylinder should be maintained at the same temperature as that of the test cylinder containing soil specimen. Insert the hydrometer in this comparison cylinder containing distilled water and the dispersing agent and take the reading corresponding to the top of the meniscus. 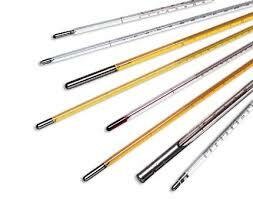 The negative of the hydrometer reading so obtained gives the composite correction (C). The composite correction is found before the start of the test, and also at every time intervals of 30 minutes, 1 hour, 2 hours and 4 hours after the beginning of the test, and afterwards, just after each hydrometer reading is taken in test cylinder. The temperature of the suspension should be observed and recorded once during the first 15 minutes and then after every subsequent reading. The results of the Table 2 are plotted to get a particle size distribution curve with “percentage finer” (N) as the ordinate and the “particle diameter” (D) on logarithmic scale as abscissa as shown in Fig. 7. D = diameter of particle in suspension, in mm. t = time elapsed between the beginning of sedimentation and takin of hydrometer reading in minutes. Sodium hexametaphosphate has been found to ineffective when dealing with certain highly flocculated soils. 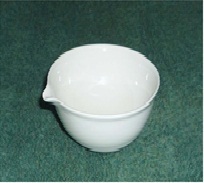 In such cases dispersion may be carried out by adding N-sodium hydroxide solution at the rate of 4 ml per 10 g of soil. The suspension should be kept out of direct sunlight and away from any local source of heat. Evaporation should be retarded by keeping a cover on the measuring cylinder between the readings. 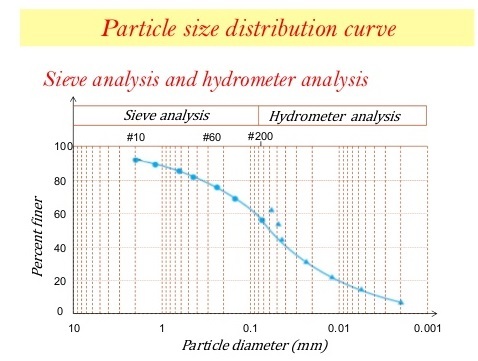 The specific gravity should he determined for the fraction of the sample passing 75 micron sieve. This method shall not applicable if less than 10% of the material passes the 75 micron IS Sieve.